Citizens of many foreign countries who wish to enter New Zealand must first obtain a Visitor Visa.The Visitor Visa is applicable if you want to travel to New Zealand as a tourist, visit family and friends, or do a short course. Travelers will need to show proof that they can support themselves and everyone included in your application during their stay. First of all, make sure you need this visa – people from certain countries can travel to New Zealand without applying for a visa first. We call this traveling visa waiver. 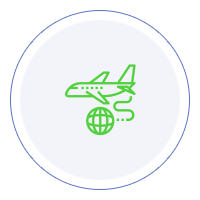 You can check our visa checker tool to verify your eligibility. The first step to apply for a Visitor Visa is complete an online application. During your application, you will be required to submit relevant documents such as your passport and your travel itinerary. Once you have electronically submitted your online application, you will receive the visa confirmation by email. Be sure to answer all questions on the application accurately and completely. Evidence of your plans in New Zealand. This needs to include your purpose of travel and daily activities for when you are in New Zealand. Residence address in New Zealand. Financial ties and commitments in your home country and how they correspond to the intended stay in New Zealand. List of all your periods of employment. The Visitor Visa is valid for 18 months from the date of issue. Your stay in New Zealand with a visitor visa is limited to 9 months. You must have a ticket to leave New Zealand. With this visa you can study for up 3 months. You can obtain a New Zealand Visitor Visa if you are a genuine tourist and can show evidence of your intention to leave. You are not permitted to work or accept employment with the Visitor Visa. You can apply for a work visa after obtaining a Visitor Visa. You must provide proof that you have enough money to support yourself during your stay in New Zealand. You must have a passport that is valid for at least 3 months past the date you are going to leave New Zealand. What is the visitor visa? The Visitor Visa is an official document permitting entry into and travel within New Zealand. With this visa you can visit friends and family, explore New Zealand, enjoy amateur sports or adventure activities and study for up to 3 months. What do I need to apply for a Visitor Visa? What is the cost to obtain a New Zealand Visitor Visa? The Visitor Visa costs 165 USD. Additionally, there is a service fee of 70 USD for standard processing. For rush processing and super rush processing the service fee is 90 USD and 110 USD, respectively. Standard Processing Time: 30 days. Super Rush Processing: 15 days. How long is the visitor visa valid for? The applicant's passport must be valid for at least 3 months past the date you are going to leave New Zealand. And it should have at least one blank page. What is the maximum stay allowed with a visitor visa? The maximum stay allowed is 9 months. You probably know that most people go to Croatia these days because Game of Thrones was filmed there, right? It is the same with New Zealand. The movie differs though. A lot of tourists go to New Zealand because that is the place where Lord of the Rings was filmed. It is not an uncommon reason why you want to go there, but you should keep in mind that New Zealand is more than Mount Doom or the place where the hobbits live. Not to disappoint you or anything, but you will not find any hobbit there. You will learn that Kiwis love to walk barefoot in the grass, though, which is pretty close. You may have seen that I referred to the people of New Zealand as Kiwis. A lot of people do not know this, but that is how they are actually called, Kiwis. The last thing you want to do is tell a Kiwi that he or she is a New Zealander. That is not a thing. You have probably noticed that in Lord of the Rings the country of New Zealand is incredibly beautiful, and the media generally portrays it as a small piece of heaven. If you are wondering that what you see is actually true, ask no more. In reality, New Zealand is a lot more beautiful. Everything is green all the time, and the people there treasure nature, which is why everything looks clean. If you are looking for a place in the world where you can get the best pictures, New Zealand is one of them. The landscapes are almost unbelievable, and the scenery is mesmerizing. You will not regret taking that really long flight. When you plan on going to New Zealand, you would think that you do not need a dictionary because the Kiwis speak English. While that is true, it is not the English you are accustomed to. If you are asked to pass the tomato sauce, you need to give the ketchup. Also, if you hear someone that he or she wants to go tramping in the bush, do not assume the worst. They just want to go hiking in the forest. Plus, your thongs, as in underwear, refer to flip-flops in New Zealand. So no, you do not need an interpreter to get around but you need to realize that what they mean does not necessarily coincide with what you understand. The people in New Zealand are incredibly welcoming, and they will make you feel at home. They are very friendly and will jump in to help you if need be. But one of their habits is to constantly ask you what your opinion about New Zealand is. Sometimes, that will occur multiple times. You need to be patient and answer every time. However, if there is a small thing that you do not like, you do not need to share it. Kiwis love their country, and you do not want to kill the mood because of a little thing that does not even matter that much, right? One aspect that you will probably not like is the fact that New Zealand does not have an extensive railway system. There are trains that connect the larger cities, but other than that, the only option for you is the road. Whether you travel by bus or by car, you will end up hating to be on the road. Not to mention that New Zealand is not that small, surface area-wise. Plus, the roads are narrow and sometimes downright scary. Unfortunately, you do not have much choice in the matter, which is why you need to learn to love it. And you can you do that by renting an RV. Going around New Zealand in an RV is the best way to experience the country. Moreover, and you are going to love this, you can set up camp anywhere you want. All natural parks, which are most of New Zealand, are available for you to enjoy and stay a couple of days. This is one of the beauties of New Zealand. You are allowed to take it all in. It is a small gesture that makes the difference between a meh trip and an incredibly pleasant one. You can park your RV next to anything you want, which allows you to have breakfast, lunch, and dinner in the most beautiful places. There is one rule, of course. You must not litter. You need to preserve the country’s beauty by packing up all your garbage and disposing of it properly. That is common sense, anyway, so it should not be hard to do. While the cuisine of New Zealand is exceptional, what you will notice is that every single place of service in the country serves incredibly good coffee. Whether it is a nice restaurant or a small gas station in the middle of nowhere, the Kiwis always have great coffee. Surely you are going to drink some while there, and you will see that their beans are among the best you will ever have. There are not a lot of things that will bug you in New Zealand, except for the sandflies. They will literally bug you, and if you do not have a repellent, your ankles will look like they are being eaten by a million fire ants. I am not even kidding. The Kiwis will warn you about them since they hate them as well. For some reason, they hate possums too, so do not bring up the fact that they are cute and cuddly. The bottom line is that New Zealand should be on your bucket list. It may be far from virtually anywhere in this world, but once you get there, the fatigue and the jet lag will be worth it. You have so many things to see and so many adventures you can enjoy. The people have this attitude that will make you instantly happy, and you will have one of the best experiences in your life. Not to end this article negatively, but the internet, in places where there is any, is very slow and will most likely frustrate you. But other than that, New Zealand is a place you must see at least once in your life. Which nationalities are exempt to apply for a visitor visa? The following countries are exempt: Andorra, Argentina, Austria, Bahrain, Belgium, Brazil, Brunei, Bulgaria, Canada, Chile, Croatia, Cyprus, Czech Republic, Denmark, Estonia (citizens only), Finland, France, Germany, Greece, Hong Kong (residents with HKSAR or British National (Overseas) passports only), Hungary, Iceland, Ireland, Israel, Italy, Japan, Korea (South), Kuwait, Latvia (citizens only), Liechtenstein, Lithuania (citizens only), Luxembourg, Macau (Macau Special Administrative Region passports only), Malaysia, Malta, Mauritius, Mexico, Monaco, Netherlands, Norway, Oman, Poland, Portugal (with the right to live permanently in Portugal), Qatar, Romania, San Marino, Saudi Arabia, Seychelles, Singapore, Slovak Republic, Slovenia, Spain, Sweden, Switzerland, Taiwan (permanent residents only), United Arab Emirates United Kingdom (must have the right to reside permanently in the United Kingdom), United States of America (includes USA nationals), Uruguay, Vatican City.